If there's one thing the city of Dongyang is famous for, it's the town's local delicacy—Virgin Boy Eggs. No, they aren't the the testicles of children as one might guess, just regular chicken eggs...that have been boiled and steeped in the urine of elementary school students. The recipe for Virgin Boy Eggs is quite simple really. One first collects a bucket of piddle from the local primary school. Only the water of boys under the age of ten is suitable. 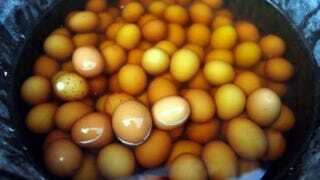 Virgin Boy Eggs are first soaked in in a pot of urine, then brought to a boil. Once firm, the eggs' shells are cracked to allow fuller penetration, and bathed regularly through out the day with fresh piss to prevent them from overheating.